The shape of this bird looks good for a duck, so that's where we'll begin. The outstanding plumage feature of this bird is the sharp division between the dark cap and the pale cheeks. This particular pattern is associated with several of our ducks, especially American Black Duck, Ruddy Duck, and Black Scoter (females and immatures). An American Black Duck would show a dark line through the eye, which our bird lacks. Our bird also appears to be riding fairly low on the water, which suggests that it isn't one of the dabbling ducks. The dabbling or puddle ducks are more buoyant than the diving ducks and as such tend to ride higher on the surface of the water. A Ruddy Duck would show unmarked white cheeks (adult males), or grayish cheeks with a prominent dark horizontal line (females and immatures). The cheeks of our bird are grayish and lack a dark horizontal line. That leaves Black Scoter, which is what this bird is. 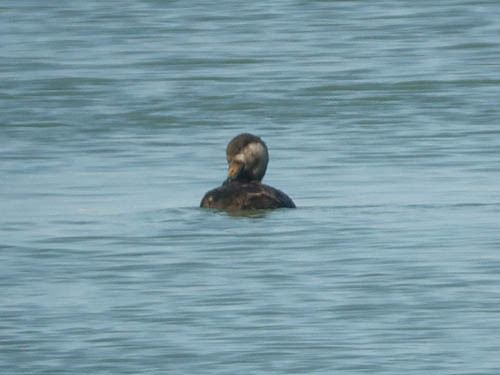 This Black Scoter, probably an immature male because of the yellow on the culmen, was photographed at North Point Marina in Lake County, Illinois on March 29, 2008.